Delightful Georgian and part Victorian stone and brick built property overlooking the picturesque town. Once a public house (The Bricklayers Arms) it sleeps six in three bedrooms, one double and two twins. 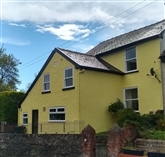 Renovated to a high standard with two modern bathrooms, new kitchen and full central heating while retaining the exposed beams, large inglenook fireplace and wood burner in the living room. Hill views from all bedrooms. South facing rear garden with stunning views. Three minutes walk from the centre of this lovely market town. Glorious countryside all around with well marked walks and the Shropshire Way goes right past the house. 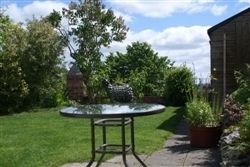 Our aim with the cottage is to give guests the best possible holiday in our lovely cottage in this beautiful part of rural Shropshire. We always try to make that extra effort to make your stay special from homemade marmalade to advise on the great walks and places to visit in the area. The feedback we recieve in the guest book and online shows this is appreciated as does the number of return visits. Non Smoking House. External steps and internal stairs and as such may not be suitable for the elderly, infirm or wheel chair users. 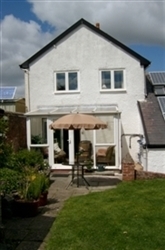 We have visited lots of holiday cottages in our time and we would put your cottage in the top 3. Well done 5 out of 5. Great 'home from home' in a fantastic location. Could not fault the property. Owners left logs for fire, included all linen and even left a bottle of wine and delicious, homemade jam - just lovely.